In Ark: Survival Evolved, players wake up naked, starving, and presumably amnesiac, on the beach of an island filled with other humans trapped in a similar state. They must "hunt, harvest, craft, research technology, and build shelters," in order to survive the hostile environment, dangerous wildlife, and potential enemies. It all sounds very routine and a bit dry—until you get to the part about riding dinosaurs. "Tame one of 60 amazing dinosaurs and other prehistoric beasts, including gargantuan creatures on a scale never before seen in video games!" the announcement states. "Fly a Pterodactyl squadron over the snow-capped mountains, race through the deep jungle with your pack of trained Raptors, tromp through a fortified enemy base along a convoy of gigantic Brontosaurus, or chase down prey on the back of a raging T-Rex." And not just prehistoric, but ahistoric: Developer Studio Wildcard warned that dinosaurs aren't the only dangerous creatures on the island, and I'm pretty sure that at least a couple of the beasts that appear in the announcement trailer never actually existed in real life. But as is so often the case, the most dangerous game of all is not monster, but man: Players will be able to join up in large-scale tribes to collect, and compete for, resources, experience, respawn points, and more. 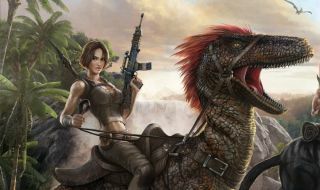 Ark: Survival Evolved goes live on Steam Early Access on June 2, with a full release expected to happen in early 2016. Let's hope it works out better than that other dinosaur game.